Last week I started reading a much-hyped "best book ever" novel but by Friday I couldn't do it anymore. It was lusty and violent. It left nothing to the intelligence. I kept thinking "Not of good report. Not of good report." Look, nobody likes a little lust more than me, but when the author starts to stretch adjectives to describe reproductive organs it's too much. So I threw the book in the trash. "Chup" says I, that very evening "I need to go and buy the book Bound On Earth that everyone at Segullah keeps raving about." And so we made it a date to go the next day to purchase a new book for me to devour. 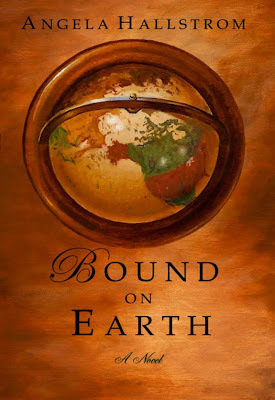 But the next morning, when I checked my e-mail, to my surprise Ms. Angela Hallstrom, author of Bound on Earth, had sent a message to my in-box. Would I like a copy? Call it The Secret, or Treasures for Righteous Living, or What You Get For Throwing Trash In The Garbage but I couldn't help but feel rewarded. Plus, she promised some "Mormon lust." The best kind. The safe kind. On Monday the book was in my mailbox. And by page 4 I was already feeling major emotions. The novel follows a storyline of a Mormon family, moving through generations, all bound together through covenants. All of the stories are familiar. Really familiar. It was though Angela had read my journal for inspiration. And having just read other reviews, I see that I am not the only one with that suspicion. On Mormonmentality.org reviewer Annegb says "Angela Hallstrom got inside my brain and wrote a book about it." And Darlene Young (one of my favorites) said "She and I could be twins in the kinds of stories we like, the kinds of situations we find interesting to write about." In particular, the book starts with a young couple having marital problems caused--in my opinion--by the husband's lackluster choices. Having been in a similar (eerily similar) situation in my real life, I quickly hoped that the wife (Beth) would resolve the problem in the same manner I did. Leave. Run. For your life. Beth: I've been digging and digging. I don't know how long I'm supposed to keep digging until it's okay for me to stop trying to find him. Tied to this story are other stories of relationships. Beth's grandmother, her parents, her sisters. All sharing a similar theme through differing perspectives. Answering likewise difficult questions: When to stop having children? When to let the wayward child go? When to stand up for yourself? And in the far past, a great grandmother is chased by maternal tragedies and her desire to hold on to her last living baby. When to believe in miracles? It nearly hurt me (read: anxious) to wait until the plot resolved in the end. And when I was finished (I couldn't put it down, it sadly took less time to read than I would've liked) I sat on my couch and thought about choices. Staying verses leaving. I felt grateful for generations of couples in my family who decided to stay bound to their covenants. Our covenants. But I was also grateful to have known when covenants weren't meant to be made. My covenants. And grateful still to have spent time reading a book of good report.